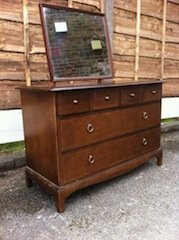 A vintage Stag minstrel dressing table and removable bevelled mirror, having four small over two large drawers. 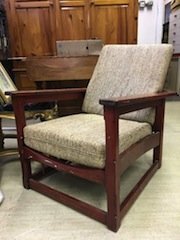 A vintage mahogany recline back fireside armchair, upholstered in stone canvas. 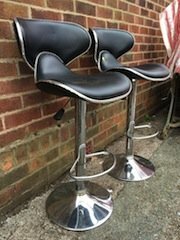 A pair of tall chrome swivel breakfast bar stools with footrests, upholstered in black faux leather. 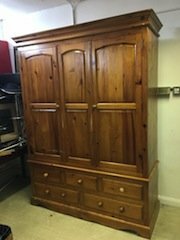 A tall standing solid pine triple wardrobe, having three over two drawers to the bottom. 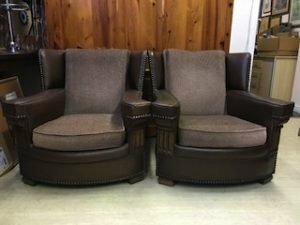 A pair of retro wing back gentleman’s armchairs on solid oak feet, upholstered in chocolate brown leather and velour. 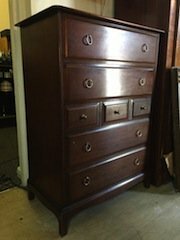 A tall standing vintage Stag minstrel chest of drawers, having two large drawers above and below three small central drawers. 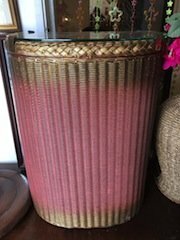 A tall glass topped hand painted pink and gold Lloyd Loom washing basket. 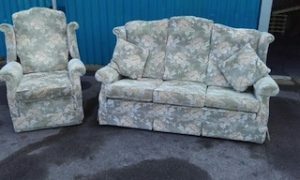 A three seater high back vintage sofa and matching armchair, upholstered in floral patterned green velour. 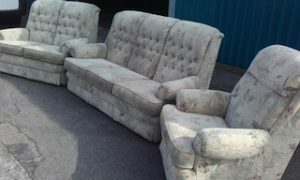 A three piece sofa suite, to include a two seater sofa, a matching armchair and square footstool. 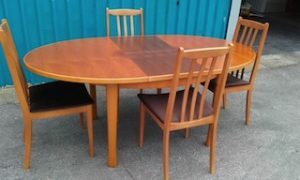 A solid wood oval extendable dining table, together with four matching high back dining chairs, upholstered to the seats in chocolate brown suede. 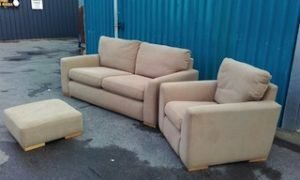 A three piece vintage Parker Knoll sofa suite, to include a three seater high back sofa, a two seater high back sofa and a matching armchair. 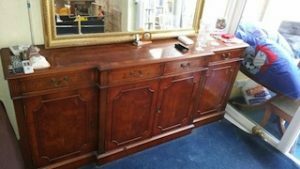 A large vintage yew wood sideboard, having four drawers above two single and one double cupboard. 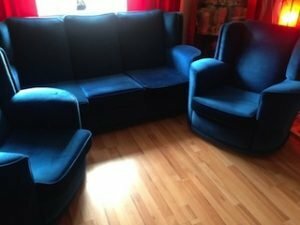 A three piece sofa suite, to include a three seater high back sofa and two matching armchairs, upholstered in navy blue velour. 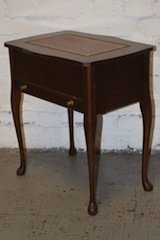 A small solid mahogany vintage leather topped sewing box table, having one small drawer to the bottom. 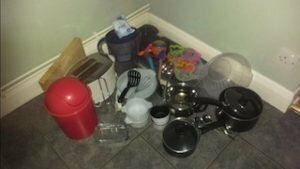 A large collection of kitchen accessories, to include a white two slice toaster, a small red plastic bin, saucepans, utensils etc. 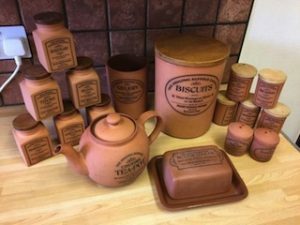 A large collection of Watson Suffolk terracotta pottery kitchen accessories, to include a teapot, a large biscuit barrel, a butter dish etc. 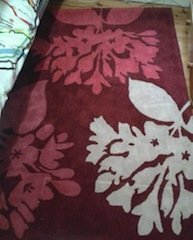 A large woollen rectangular area rug, decorated with red and white flowers against a deep red ground. 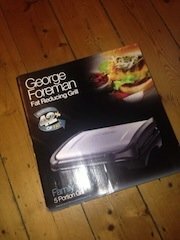 A brand new boxed George Foreman silver and black five portion fat reducing grill. 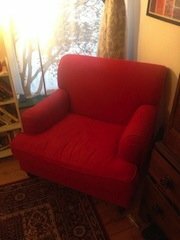 A contemporary low back fireside armchair on castors, upholstered in bright red fabric. 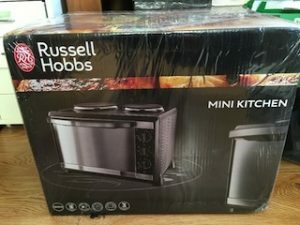 A brand new boxed Russell Hobbs black counter top mini kitchen.